Cloudways provides an incredible platform for Laravel Community. It makes it easy to deploy and host laravel applications so that developers can focus on the development process rather than worrying about deployment and server level issues. Easily deploy Laravel applications from Github or Bitbucket. Server Cost is included in the Cloudways price plan. Hence developers only need a single account and receive a single invoice. Auto deployment for Laravel applications. Monitor everything with the New Relic monitoring system. Easy server management features including server cloning and server transfer. One click auto backup with frequency ranging from hourly to weekly. Scale up servers with easy vertical scaling. 24×7 live chat support by cloud professionals. Team Collaboration feature assigns server and application access and roles to the members of the team. To set up a PHP 7 server on DigitalOcean at Cloudways, simply sign up at Cloudways and login to your account. Go to Launch server. Select your PHP stack, DigitalOcean as your infrastructure provider and identify your server resource needs along with other required details. And you’re done! Your Digital Ocean server will now be deployed within minutes. As a developer, you likely have your Laravel application on a GitHub repository. You can easily deploy it on your Cloudways server in a matter of minutes. To deploy the application from a Git repo, first, in the Platform dashboard, click the ‘Applications’ tab from the top menu bar and select your application. Now, in order to deploy the application, you will now need an SSH key. To generate the SSH key, click on the ‘Deployment via Git’ button on the ‘Application Management’ area and then click the ‘Generate SSH Keys’ button to generate your unique SSH key. To download these keys, simply click ‘Download SSH Keys’. Cloudways supports all major PHP frameworks including Laravel, Symfony, Codegniter and CakePHP, and allows one-click installation of your favorite PHP-based CMS like WordPress and Bolt. Let’s run through a sample case of setting up PHP 7 on a DigitalOcean server using the Cloudways Platform. Now upload the ‘SSH Public Key’ to your GitHub account. In order to do this, login to your GitHub account, go to the desired repository, and then into the ‘Settings’ tab. 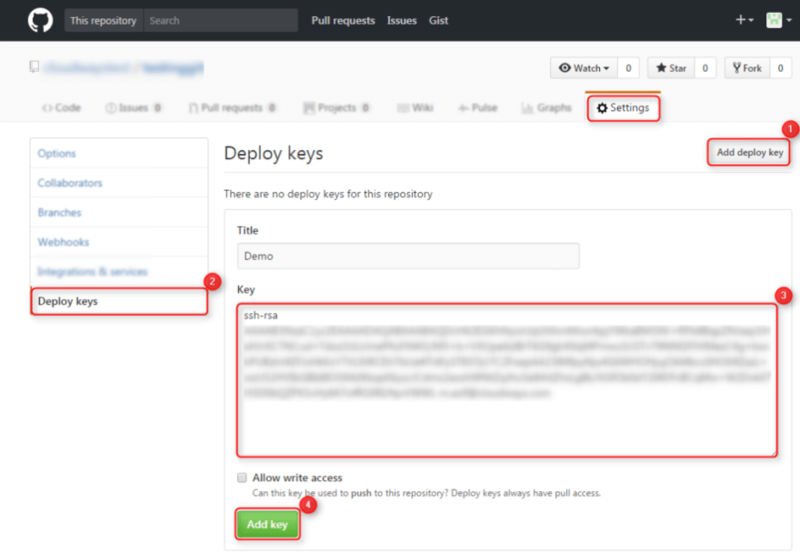 Click the ‘Add Deploy Key’ button and add the Public SSH Key **which you have downloaded from Cloudways platform. Click the ‘Add Key**’ button to finalize the process. Now copy the ‘Repository SSH Address that you will see in the top panel in your main GitHub dashboard. Copy and paste this address in your Cloudways’ ‘Git Remote Address’ field. Next, you need to input the deployment path and click on ‘Start Deployment’ button to have your application code deployed onto the Cloudways platform! That’s It! Cloudways makes it’s that easy to deploy your Laravel application on the cloud infrastructure of your choice. As you can see, you can easily deploy your Laravel application with Cloudways. It allows you to easily handle some of the most important Laravel application hosting issues. From setting up your server and server resources initially, deploying your application, to managing backend application tasks, everything is done effortlessly with Cloudways!